Need a Reason to Come To Convo? Joel Laguna. Have you registered for KDP Convo? If not, you might want to reserve your spot right. This. Second. Why? Because we have an amazing lineup of keynote speakers. A lineup that just got even better. We’ve received confirmation that Joel Laguna, who was featured in last year’s documentary TEACH, will be at Convo, sharing his story with us during the Saturday luncheon. Joel is in his sixth year of teaching and has taught at Compton High School in Compton, CA, James A. Garfield High School in East Los Angeles, and just opened a brand-new film and media magnet school in LAUSD teaching 6th grade English/History in the Silverlake neighborhood of Los Angeles. His incredible passion for teaching is infectious, and he is so excited to share his experiences and wisdom with KDP’s preservice and practicing educators. So, what are you waiting for? Register today and ensure you have the opportunity to meet Joel and hear his inspiring story in Orlando! 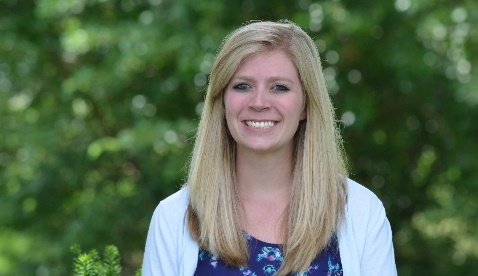 Katie Heath is the Northeast Regional Chapter Coordinator and Literacy Alive! Coordinator for Chapter Services. If you’re anything like me, you love sorting through old documents and unveiling historical information. Recently, I dug out the records for the first year of Literacy Alive! and was amazed by what I discovered! It is remarkable to see both how little and how much has changed with the Literacy Alive! service initiative over the last 22+ years. Perhaps the most exciting finding was that several of the chapters that have participated in Literacy Alive! in recent years are the very same chapters that took an active role in the program’s initial stages. I was impressed by the statistics from Literacy Alive’s! first year as KDP’s signature service initiative. While modest growth is often expected in the first few years of any new program, to have impacted so many people from the very beginning shows the true hearts of KDP members everywhere. Roughly 22 years later, I am overwhelmed with pride as I reflect on the progress Literacy Alive! has made and the impact this program continues to have on communities across the country. 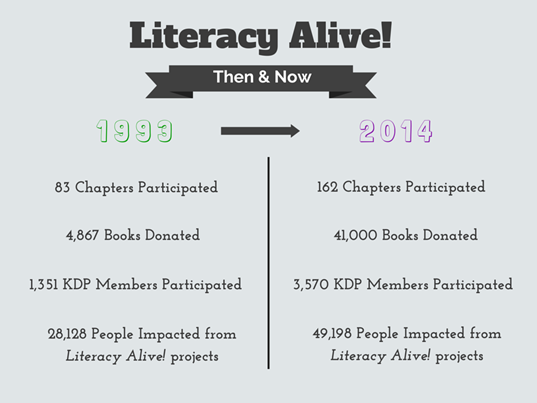 For this week’s #TBT take a look at the statistics from the first year of Literacy Alive! (1993) compared with those of last year’s programming. We hope you plan to participate in Literacy Alive! this year as KDP’s signature service program continues to grow and expand. 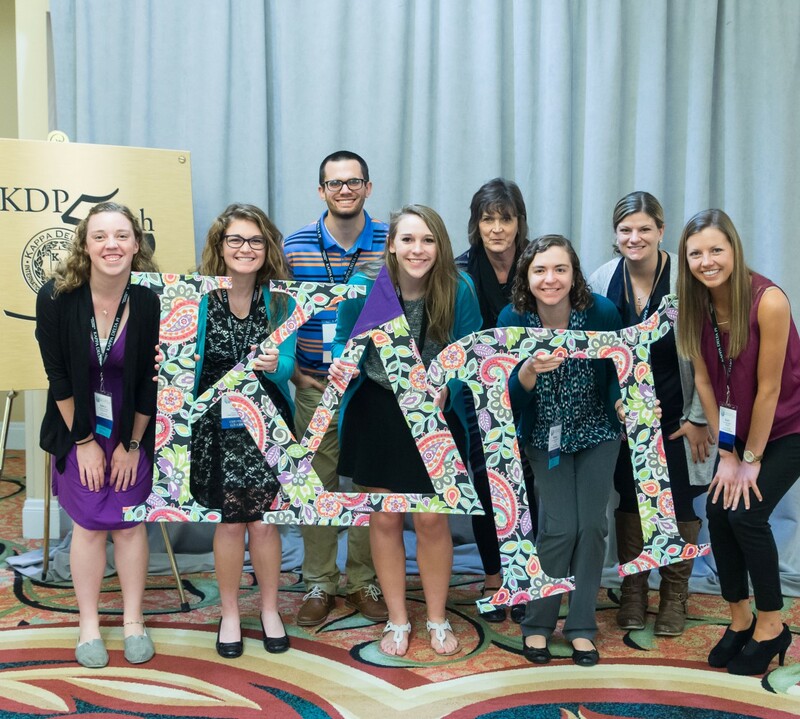 If your chapter has already held an event, don’t forget to submit the Literacy Alive! Achievement Form by May 1. If you have not yet participated, it’s certainly not too late. Check out our website for more information about hosting a Literacy Alive! project, or contact me with questions!